In conjunction with Investec’s fantastic launch of the 20×20 Media Awards, to recognise and reward excellence in Irish journalism focused on Women in Sport, a Nielsen Research study has highlighted just why such initiatives are so important. 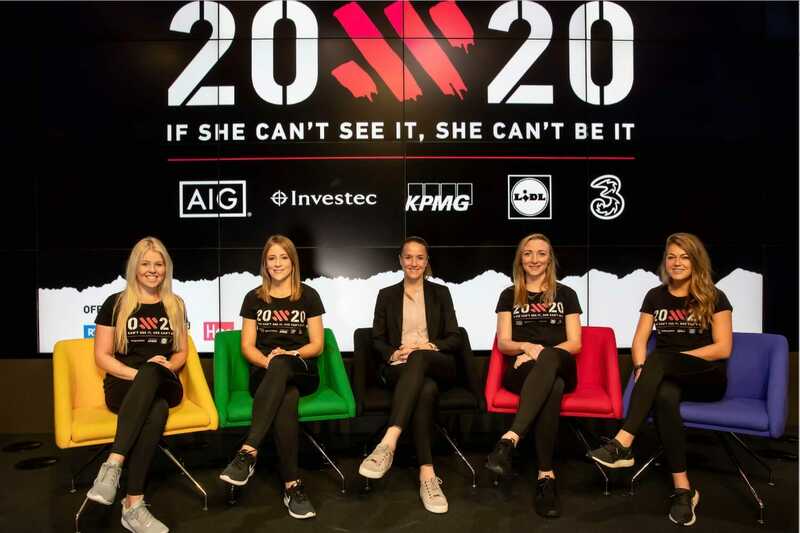 Investec is a proud sponsor of 20×20, an initiative presented by The Federation of Irish Sport which calls on the people of Ireland to provide more support for women in sport. In demonstrating its commitment to the initiative, Investec has created this new awards scheme to help change the perceptions of women’s sport. The Investec 20×20 Media Awards recognises that increased visibility will lead to greater cultural recognition of girls and women in sport. And if you didn’t think the perceptions of people needed changing, Nielsen Sports research released some eye-opening statistics in conjunction with the Media Awards launch that suggest otherwise. The 20×20 Nielsen Sports Study found that just 3% of Print and 4% of Online coverage was dedicated to women’s sport in Ireland. Further to that, based on the research, 20×20 has estimated television coverage of women’s sport is less than 12%. The 20×20 Nielsen Sports research, launched yesterday, found that 59% of Irish people believe that the media should do more to promote female sport, with 57% wanting to see equality in female and male sporting role models in media. While the research also found that 63% of people would like to see Ireland’s sportswomen become national heroes in the same way as our sportsmen. When analysing the figures, the clear split in opinion makes for disappointing reading. Given the array of talented female sportspeople in Ireland that have done us proud throughout the years; from Cheltenham race winning jockey Nina Carberry to Arsenal’s record breaking women’s goalkeeper Emma Byrne, from world boxing champion Katie Taylor to our own golfing stars in former world amateur number one Leona Maguire and the LPGA Tour’s Stephanie Meadow and beyond, you would have hoped people would be more assured in their backing of our island’s female stars. That’s why initiatives like the inaugural Investec 20×20 Media Awards, to recognise and reward excellence in Irish journalism focused on Women in Sport is paramount to changing the perceptions of the people. 20×20 reminds us that ‘If She Can’t See It, She Can’t Be It’ but if we can shift the spotlight upon our top female talent this year, it should highlight that there’s no gap in talent between our men and women; merely a false impression of one. With that said, Broadcast, print and online journalists are invited to ‘show their stripes’ and submit entries on Women in Sport via www.investec.ie/20X20 from February to November, with a winner announced each month. Entries to the awards can be submitted by nominees themselves or on behalf of journalists by editors or peers across the media spectrum. Investec’s expert panel of judges will select one outstanding piece of journalism to award each month, recognising and acknowledging that journalist’s contribution to women’s sport. Not only that but the monthly winner will receive a prize of €1,000 while an overall annual winner will be announced in December and awarded the Investec 20×20 Media Award Winner title – ‘If She Can’t See It, She Can’t Be It’ Winner 2019. The Investec 20×20 Media Awards is about recognising excellence amongst the Irish journalism community in the reporting of women’s sport and the profiling of female athletes. Investec wants to lead the charge and tackle the lack of visibility of Irish sportswomen and aims to drive more print, online and broadcast media coverage in women’s sport. Entries are welcomed from all media. This can include game-changing profiles of inspirational sportswomen, investigative news, opinion pieces, business interviews, articles and interviews from boxing to golf to hockey and every other sport in between. Anna Kessel, the Chair of the Investec 20×20 Awards judging panel is hopeful that once and for all, the initiative will help drive home the message to the people of Ireland that women’s sport matters. “In celebrating women’s sports journalism, the Investec 20×20 Media Awards are sending out a very powerful message: women’s sport is amazing, and of value,” said Kessel. For Investec CEO, Michael Cullen, who has long taken an active interest in closing the gap between the genders, he has encouraged journalists to enter the awards as an opportunity to use their skills to champion women in sport. “In working to increase media coverage for women’s sport by 20%, it is fitting that as an official sponsor of 20×20, we recognise and reward media for promoting women in sport – ‘If She Can’t See It, She Can’t Be It’,” said Cullen. This announcement comes just over four months after the 20×20 initiative was launched and since its arrival, the 20×20 idea has captured the minds of people throughout social media channels and beyond. For Co-Founder Sarah Colgan, the response has been incredible and the CEO at Along Came A Spider’s own 2020 vision has only been enhanced by this latest development. “The 20×20 campaign is starting to gain real momentum since the initiative launched in October 2018,” said Colgan. Further to those taking part in the media competition, everyone keen to get behind the 20×20 initiative in any way possible are encouraged to share their contributions on the 20×20 social media channels on Twitter, Facebook and Instagram using #20×20, #ShowYourStripes and #CantSeeCantBe. It most certainly has taken us too long to get here but in the words of Bob Dylan, finally, ‘the times they are a changing’. Has Malachy Clerkin been watching Happy Gilmore again ?